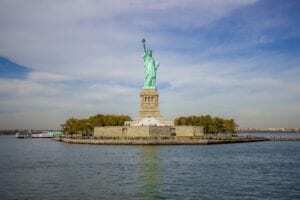 The authorities of New York brought charges to the participant of the protest, who sat on Wednesday almost four hours at the foot of the Statue of Liberty. As he notes, 44-year-old Patricia Okoumou was accused of illegally entering the closed territory, disobeying the order’s guards, as well as obstructing the work of government agencies. The activist declared her innocence. For each of the charges, she may face up to six months in prison. According to the New York Daily News, Patricia Okoumou was charged in 2017 that she had struck a policeman during a protest and resisted detention. On Wednesday, Patricia Okoumou participated in a demonstration against the immigration policy of the US presidential administration, Donald Trump. Several demonstrators deployed on the island of Liberty, on which the statue, a cloth with an appeal to abolish the Immigration and Customs Service of the country. In connection with the incident, people from the island (mostly tourists) for safety reasons were evacuated. The police detained seven protesters, but Patricia Okoumou climbed to the foot of the statue. Police officers for more than two hours unsuccessfully tried to persuade her to come down. According to CNN, the woman stated that she would go down only if “all children were released.” It’s about the children of illegal immigrants separated from their parents. According to the practice for several months in the US, the children of illegal immigrants arrested while crossing the border between the United States and Mexico were separated from their families. As a result, two police officers climbed up and escorted the activist down. Patricia Okoumou was immediately taken into custody. In recent weeks, a number of political opponents Trump advocated a ban by the US Immigration and Customs Service. It is part of the US Department of Homeland Security, including patrolling borders, detaining and deporting illegal immigrants. The service was accused, in particular, of excessively cruel treatment of illegal immigrants. Previous PostPrevious Did You Know the IRS Can Now Take Your Passport?